A rare tablecloth from decades ago has been transformed into a party dress, size K-1st Grade (5-6 years), measures 24” armhole to armhole, 21” shoulder to hem. 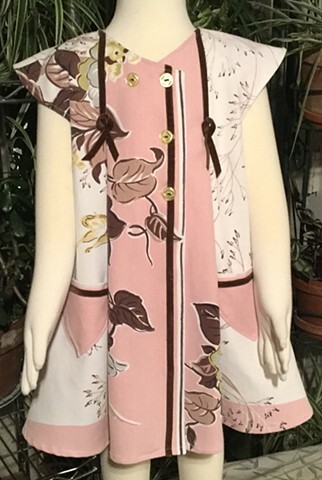 Front overlapping closure with color-complimentary buttons, built-in cap sleeves, inverted box pleats in front and one big one in back, pointed pockets, features butterflies and brown velvet trim here and there. $90, 100% cotton, made by the designer herself and shipped free to any address in the U.S.